The Heinkel He-51 was one of the Luftwaffe's first really effective fighter aircraft. Though outclassed in almost all respects by the aircraft of other nations and by the Arado Ar-68, it was, nonetheless, a good aircraft and the basis for many of the fledgling air arm's first fighter squadrons. Rugged, somewhat forgiving and highly aerobatic, the He-51 was the first fighter aircraft that many of the later aces of the war were to fly. The He-51 was sent to Spain in 1936 to bolster the Spanish Nationalists and to give German pilots and crews the opportunity to test their aircraft in combat situations. While doing fairly well, it was soon obvious that the Heinkel fighter was outclassed by the Republican and Russian pilots flying the I-15 and I-16 fighters. 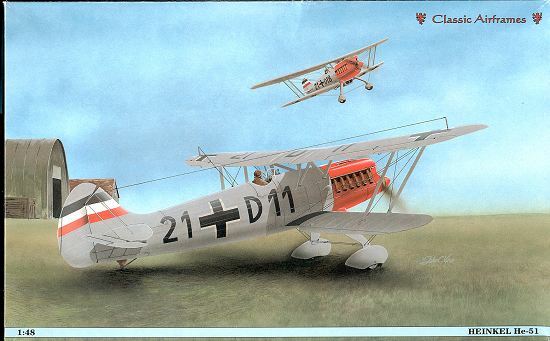 Even the Italian Fiat CR.32 was a superior aircraft to the Heinkel. Where the He-51 finally found it's place was as a ground attack aircraft. Led by Oblt. Adolph Galland, the tactics of cooperation with ground forces were developed that served the Germans so well in the lightning campaigns in Europe in 1939 and 1940. 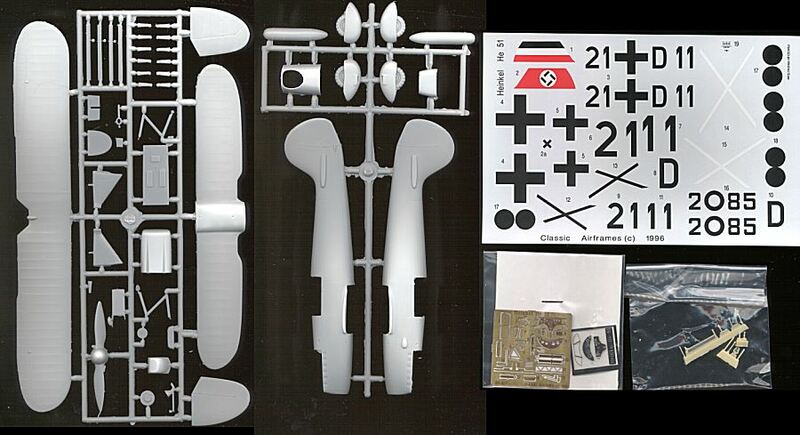 This is Classic Airframes' seventh kit and was released in 1996. What one gets with the kit are two sprues of somewhat flashy medium grey plastic with a fret of etched brass. The plastic is somewhat soft and has a sort of sandpaper feel to it. In addition one gets some resin bits, a decal sheet for two examples by Propagteam, and a color sheet for the two paint schemes. The instruction sheet is a single sheet folded to give four pages. The first page is a parts diagram, the next two are construction blocks. They are not the most logical in sequence so you really need to pay attention to what you are doing. There is a painting guide with all the paint colors called out by letter. Interestingly, there is a paint letter called out in the instructions that has no guide. This is color 'E' and is for most of the interior as well as the seat harness. I can only assume that it is RLM 02 green-grey. The rigging diagram is especially helpful for, if you are like me, rigging isn't your most beloved talent!! Overall it looks like it can be built into a very nice kit, however one must always be aware that it is a limited run kit and so careful dryfitting of all parts is necessary to produce a quality result.